This blog is dedicated to water quality, water and wastewater treatment and everything else water. 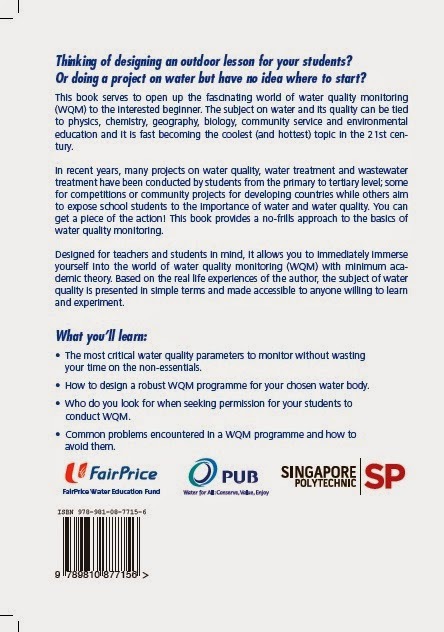 It also discusses various activities in environmental education by the author to impress upon our students water issues and the importance of good water quality. Leave us your particulars and we will keep you in the loop on the latest news, advice and workshops associated with water quality in industry and education. Rest assured your particulars will never ever be shared with any third party. 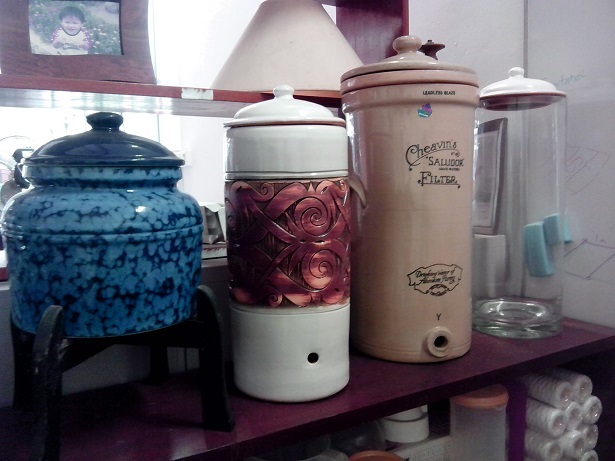 Do we really need water filters? Sawyer Mini. My current favourite portable water filter - small, superb capacity, versatile. More info here Big Berkey water filter with 4 British Berkefeld Super Sterasyl ceramic candles My recommended residential gravity filter elements/candles. More info here. The must-have resource for the rainwater harvester. More info here. Continuing from my earlier 2 posts (1, 2) on NSF/ANSI standard 42, here's the meat in describing this commonly encountered standard for "drinking water treatment unit" (read water filters). If you are the lucky few who have a copy of the document, it certainly makes for good bedtime reading i.e. getting you to sleep. Therefore, I will try to be short and sweet in this post. Even though the title of this standard states "aesthetic effects", it actually covers quite a lot of details in a water filter, and not just how well the filter works in improving the aesthetics of drinking water. The standard apparently can apply to a "system" (e.g. entire filter unit) or a "component" (a single part of a filter unit). I assume my readers are more interested in evaluating an entire system so I shall focus my discussion on a "system". (This decision is also a conservative measure since the requirements for a component are less stringent than for a system.) Buyers beware: make sure the standard covers the whole filter system you are buying, and not just certain components inside. To be certified, a filter system must satisfy the five following conditions. System materials in contact with drinking water must not leach chemicals into the water within specific limits. Chemicals to be tested include aluminium, mercury, vinyl chloride, xylenes and many others. Much is described about how testing is done and the chemicals of concern. In other words, you don't want to buy a filter that adds poisons into your drinking water. With such a filter, you don't need poor filtration effectiveness to harm yourself. Structural integrityThis part talks about pressure testing the materials, design and fabrication quality of the complete system. Basically, your system should not fail (burst, leak) under specific conditions. Minimum performance requirementsThis slightly misleading title actually refers to mundane matters not covered in the other 4 criteria e.g. Electrical safety and operation complying with National Electrical Code or equivalent. Filter media (e.g. activated carbon) should not migrate visibly (read leak out of the filter). Reduction ClaimsThis is most often mentioned aspect of standard 42, whether by filter suppliers or customers - how the filter reduces the concentration of a certain substance in water. Buyers beware! This requirement is potentially the one most likely to confuse a consumer on the effectiveness of a filter. To be certified, a filter has to fulfil a reduction claim of ONLY ONE substance. Make sure you know which substance that is. ABC filter certified to reduce the concentration of only chloramines will have unknown effectiveness against chlorine. Obviously, if the filtered is certified, its performance should equate or exceed that of the standard. Believe me, I have really tried to simplify NSF/ANSI standard 42 in these 3 posts as much as possible for the layperson. Hopefully, you now have a clearer idea what this standard is all about. I generally reply to an email query in a blog post if I feel it will benefit other readers. If for some reason, you would like a private reply, please state so in your query. I am currently an Adjunct Lecturer in Singapore Polytechnic. Always exploring new ways to bring experiential learning into the classroom, I endeavour to work with 3 guiding principles. I am passionate about all things water. 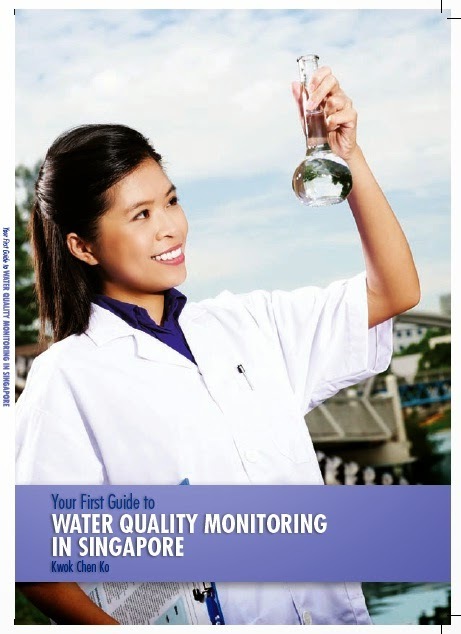 Professionally, I have worked on various water quality projects with Nparks and PUB and published the book, “Your First Guide to Water Quality Monitoring in Singapore” in collaboration with PUB. I am also the Founder and Principal of iMatter Learning Centre.